Officer Jobs in NDMC through online website portal of NDMC is http://mcdonline.gov.in/tri/ndmc_mcdportal/. The official website of the NDMC is www.mcdonline.gov.in. The application forms are available from 6th October 2018 onwards. The last date to submit the application form through online is 20th October 2018. The candidates will be shortlisted on the basis of written examination/ interview. 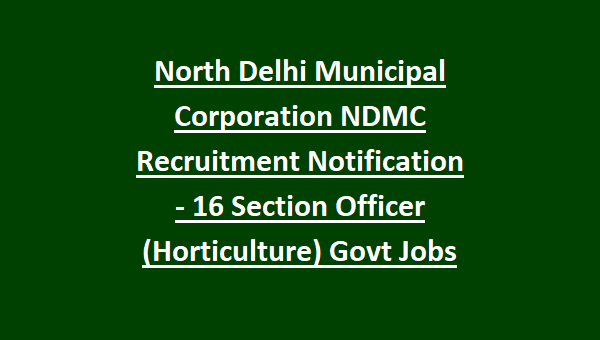 For the other information of age limit, salary, education qualification, available vacancies and application fee are given below for the Section officer jobs in NDMC. 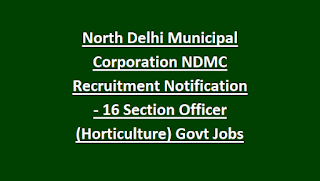 There are total 16 available vacancies for Section Officer (Horticulture) jobs in NDMC. The upper age limit for the candidates apply for Section Officer in NDMC is 27 years. The educational qualification for the Section Officer is candidates should be passed Degree in Agriculture or Science with Botany as a subject from recognized University. For more information candidates can check in the official website notification. The salary offered for the selected candidates is Rs.9300/- with Grade Pay of Rs.4200/-. For the application fee candidates can check in the Official Notification. Candidates will be shortlisted on the basis of written exam/ interview. For exam pattern and syllabus candidates will check in the official notification. Interested candidates can apply for the section officer (Horticulture) jobs through online mode. The official web portal for applying this job is http://mcdonline.gov.in/tri/ndmc_mcdportal/. The online application forms are available form 06-10-2018 onwards. The last date for submit the application form through online is 20-10-2018. The candidates can pay the application fee at the time of form submission only. For more information candidates can refer in the official website notification.